Demi Season There are 8 products. VKBO level 5 VKBO Midseason Suit.Composition: 99% polyamide, 1% elastaneIt repels moisture and protects against weathering.Fast drying.Excellent breathability.Lightweight, compact, flexible.Ergonomic cut. Goods will be delivered within 30 days of receipt of payment. Layer - 5Breathable membrane material. It is hired for windy and humid weather.All stitches are glued to provide robust protection against strong dirt, wind and sand blast.Pants and jacket can be wrapped in hidden special pockets.Composition: 100% polyamide membrane ePTFE. Goods will be delivered within 30 days of receipt of payment. 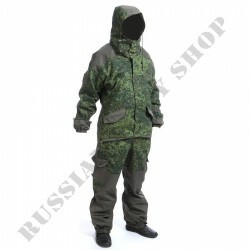 Gorka 3 is a Russian military uniform suit designed for MVD, FSB, VDV (airborne), GRU.Gorka 3 has been designed for everyday wear in battle conditions spring and autumn. 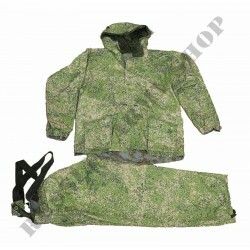 Suit is also popular amongst Airsoft, Hiking and Fshing.